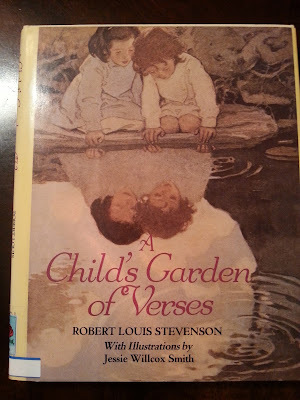 Back in 1951 (and again in 1961) a new edition of Robert Louis Stevenson's A Child's Garden of Verses, was released, with illustrations by Alice and Martin Provensen. That book is back out this year, from Golden Press. Here's a photo (a heartfelt thanks to Allie Jane Bruce for sending me these images!) of the old and new. Here's a closer look at the Provensen's illustrations of the little boy playing at being an "Indian scout" and his imaginings of Indian scouts (who are hunting lions and tigers). The Land of Storybooks is not in the 2017 edition. See? It goes from The Flowers to The Cow. That's a step in the right direction! 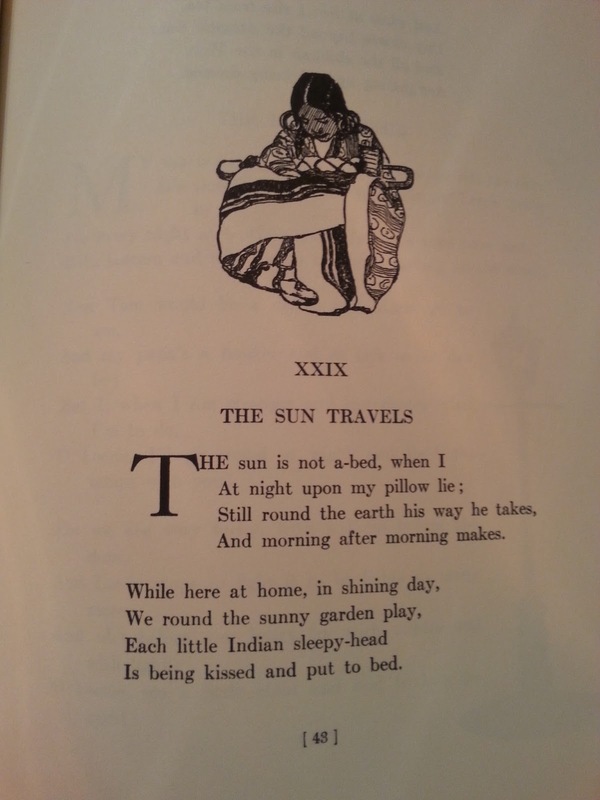 Stevenson's collections--by the way--have more than one poem that is racist in word and/or how an illustrator depicted the "Indian" in it. Over in AICL's "Foul Among the Good" gallery is an entry about Foreign Children, illustrated by Charles Robinson, in 1897. 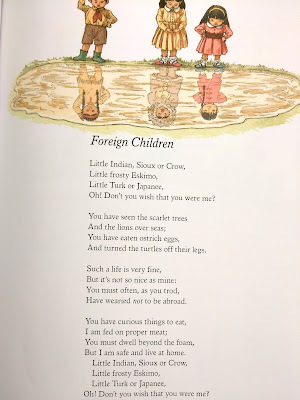 I assume Foreign Children isn't in the new Provensen edition. 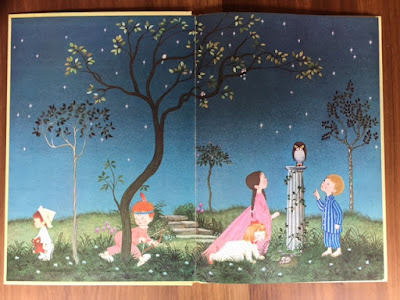 I wonder, though, how the Provensen's illustrated that poem, back in 1951? 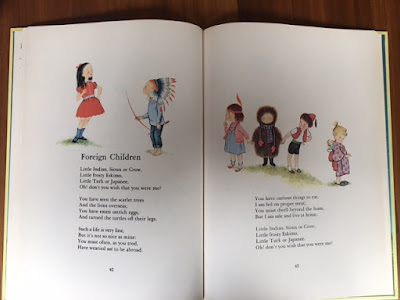 Some day, I might spend time looking up images of Foreign Children and The Land of Storybooks. 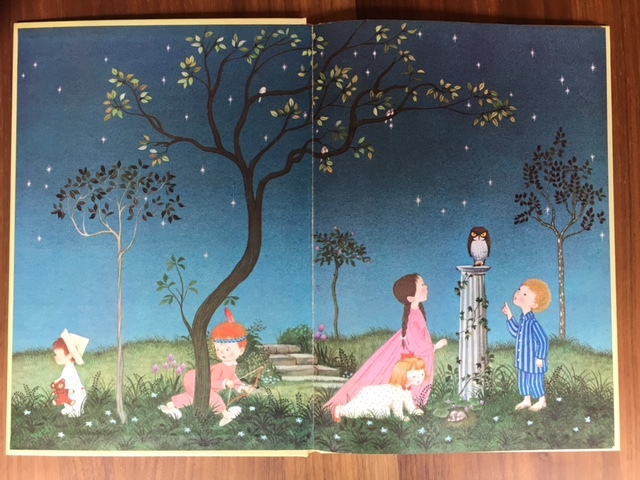 I wonder, for example, how Brian Wildsmith did those two, when he illustrated the book in 1966? What do you have on your shelves? If you've got editions with illustrations of Foreign Children or The Land of Storybooks, please take a photo of those pages and send them to me. I'll add them here. Here's Foreign Children. 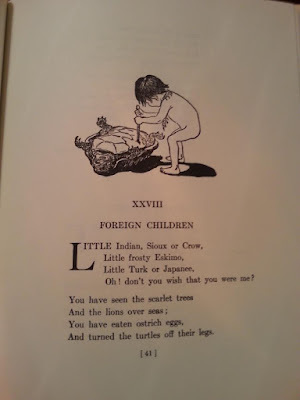 "Turned the turtles off their legs" -- what do you think? 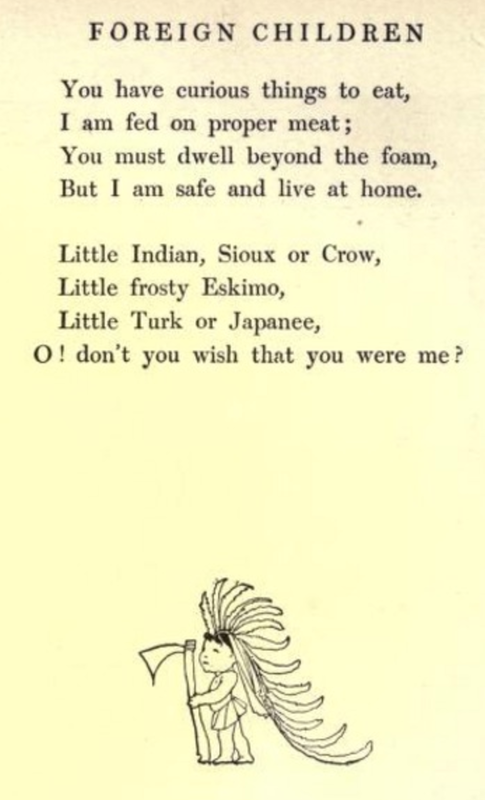 Is that meant to be the Indian, Sioux, or Crow? 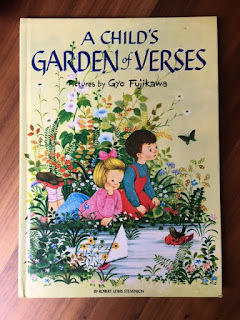 It is an interesting poem. I wonder if there's any analysis of it, anywhere? 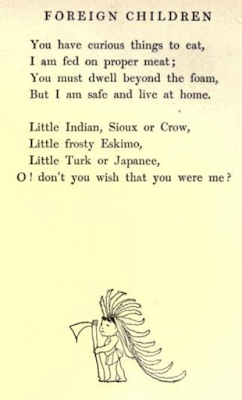 Given that Stevenson was specific with Sioux and Crow, I wonder if "Indian" is meant to be someone from India? Here's the illustration and poem, The Sun Travels. It, too, has "Indian" in it, but this time, Willcox definitely has a Native person in mind. 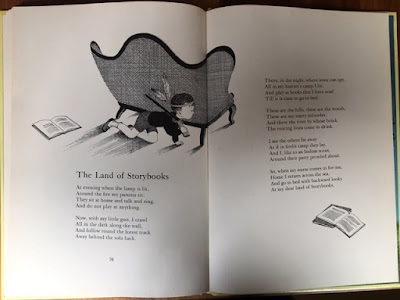 The reader also sent me the page for Land of Storybooks. Here's the illustration on top. No feathers. I think this is the child imagining himself as a hunter. 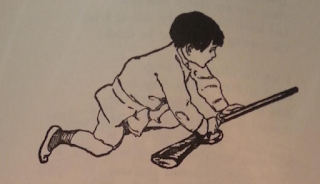 Not an Indian one, just a hunter. 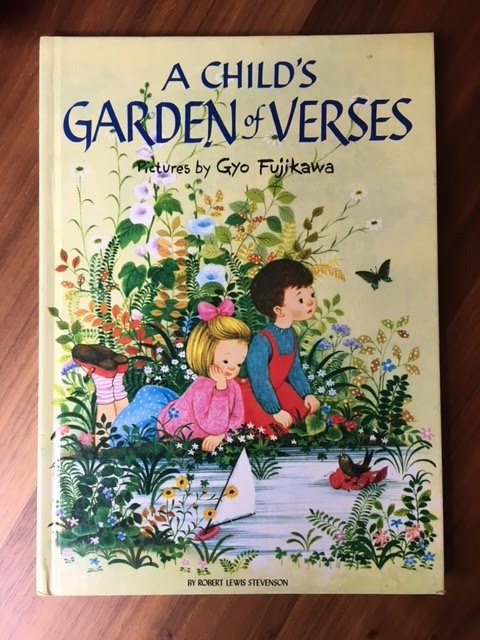 I'll keep adding to this gallery of art for Steven's A Child's Garden of Verses as I receive more photos, or as I find them. 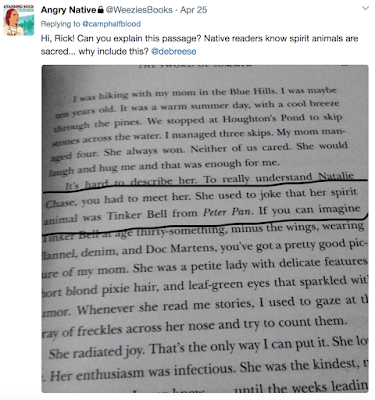 Yesterday (April 25), Weezie, the Mvskoke person who tweets from @WeeziesBooks, tagged me on a tweet about a page from Rick Riordan's The Sword of Summer*. Here's a screen cap of the tweet. Below the screen cap, I've typed up the content of the screen cap. Hi, Rick! Can you explain this passage? 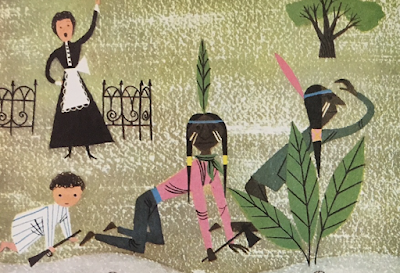 Native readers know spirit animals are sacred... why include this? It's hard to describe her. To really understand Natalie Chase, you had to meet her. She used to joke that her spirit animal was Tinker Bell from Peter Pan. Just spoke to my editor and we will delete that in all future printings. Thank you for pointing this out. Apologies for my insensitivity. In response, some people thanked him. Others said his decision was unnecessary. I'm amongst those thanking him--and Weezie, too--for bringing attention to it. He joins Julie Murphy and others who take decisive and public steps about using that phrase. I think Riordan's public decision tells us that he is aware that Native children read his books and that he wants to do right by them. In doing right by them, he's also doing right for all children who read his books. As the title of this post indicates, this is a thank you. To those who speak up, and those who listen and respond, as Riordan did. This post will be added to AICL's growing list of links to books that writers change when they revisit content like "spirit animal." If you're on Twitter, follow Weezie. And check out Weezie's Whimsical Writing. All choices about and responsibility for my text are mine. If people want to be mad at someone, they should get mad at me and me only. *My apologies to Mr. Riordan. In the initial post, I incorrectly identified his book as "The Summer of the Sword." My error has been corrected, thanks to a reader at ALSC. I deeply value email from those who point out my errors. Please don't hesitate to send them!